Morning: The most important things for beauty, aside from products is your hapiness because that is what shows in your face. You can use as many products and as much makeup, but if you’re a miserable person, nothing is going to work. The other thing is stress. Stress really affects your skin. That’s also part of choosing very good products. We live in Manhattan, for example, in a really stressful city. You want to have a good regime and try to minimize your stress. I wanted to be a dermatologist at one point in my life, when I was really young. All my life i’ve been reading all these different studies and I’ve gone to the best dermatologists in the world. I really believe in dermatology and I’ve developed beauty lines for 10 years, so I’ve had to do a lot of research. Cleansers that are very expensive are a waste of money, they don’t penetrate the skin, they aren’t left on the skin long enough. It’s better to use something really effective and inexpensive. 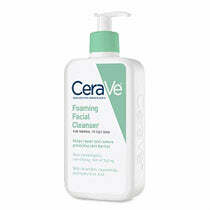 I use CeraVe Foaming Cleanser, it’s a few dollars from the drugstore. Every dermatologist recommends it. After that I use the Tata Harper toner that I helped to develop. What I really love is that it adds moisture without clogging your pores and it has a lot of Vitamin C so it’s great for brightening. I keep it in the refrigerator so it’s nice and cold and it feels wonderful. After that I follow with SkinCeuticals CE Ferulic. It’s the top free radical barrier for your skin. They are one of the things that contribute the most to wrinkles. It has a lot of Vitamin C which is good for dark spots and acne. It’s really multipurpose. For the free radicals, it’s really important that you have something protecting your skin from free radicals. I follow that with CeraVe moisturizer, it’s gentle and hydrating. It’s so important to wear a great sunscreen everyday because if you don’t, all that brightening is usless, the sun will wreck it. The sun is the worst thing for wrinkles. Sunscreen everyday is mandatory. The one I really love is only sold in Japan, so I have my friends from Japan send it to me. It’s like a Chanel whitening base with a SPF 40. I like to be really white and I love it beacuse it lightens your skin tone one or two shades and it protects you from the sun. For people who are not buying things in Japan, the best equivalent is La Roche Posay Ultralight Mineral. A mineral sunscreen is great because it has less chemicals and is very effective. Then I put on my favorite lip balm, it’s called In Fiore Veloutée. It’s really thick, so you just put a little bit but your lips are absolutely protected and moisturized. I don’t buy eye cream, I take my SPF and I put it everywhere. I put my creams everywhere, my eyes, my lips. I don’t really believe in eye creams. I think what ever you are doing for your skin is okay for your eyes. I smear everything everywhere. I love makeup. I think it’s years and years of developing makeup and skincare and my grandmother wore amazing makeup. I’ve loved makeup for forever, I’m not one of these tinted moisturizer, lip gloss girls. My biggest makeup inspiration is geishas. I start with the lip balm because it’s a great base for lipstick. I have a makeup artist that mixes a custom red lipstick for me. I’m really specific about the exact shade I want. I like the MAC Clear Lipglass, you don’t need a lot because it’s sticky but it gives you incredible shine. My favorite foundation is Armani Luminous Silk, but I think what is really important is what you apply it with. I helped in developing the company Artisse and they make the most amazing brushes in the world. I use Artisse brush #8 to apply my foundation. It looks completely air brushed. I usually go a few shades lighter. I also really like a doll faced look, so I like really rosy cheeks. I use the #6 brush to put on the Armani Blushing Fabric in Scarlotto. It’s really vibrant red and I use the brush because a little goes a long way. It’s really sheer, it’s the most amazing formula because it makes you look flush from the inside out, like you’ve just been to the gym. I’m obsessed with long dark lashes. I’ve been blessed by the universe in having crazy long ones. I don’t belive in expensive mascaras because the ones in the drugstore are incredible. The best one that I’ve found is Maybelline Illegal Length mascara. It makes them really dark, really long and really fluttery. It’s not overly volumnizing. I like something that coats the lashes and really separates them, I think that opens the eye more. A little bit of black eyeliner along the lash line really helps to make them look really black and voluminious. Any thin tipped liquid eyeliner at the drugstore works. In terms of eyebrows, I really believe they frame your face. I’m a really big believer in taking care of your eyebrows. My hair is naturally Japanese black, but the pencils that are made in the US are all kind of ashy brown. I buy Japanese eyebrow pencils and the labs that make the best eyebrow pencils are all in Japan. I buy my pencils at Sunrise Mart, the Japanese market. I can get a rice bowl and an eyebrow pencil at the same time, it’s great! Powder is important because it sets your makeup, so it makes it last longer throughout the day. You need your makeup to stay put. If you apply too much, it cakes and if you have any lines or wrinkles, it settles into your lines and wrinkles and makes you look older. My trick with powder is to find something that is milled to be ultra fine so it doesnt cake and is also luminizing, so your skin doesnt look ashy. The best I’ve found is Chanel’s Poudre Crystalline. I am also really devoted to lasers. I think Fraxel is the most genius thing every invented. It’s strong but it’s not like so strong that you look like a burn victim. With Fraxel, in 3 days you’re okay. In three months you see your dark spots disappear, any acne you have is gone, your skin become so plump and hydrated, it produces a lot of collagen. You look like you have baby skin. I do it once a year. I think everyone is different depending on wrinkles, sun damage, dark spots, but for me one fraxel a year is great. I have the most amazing hair dresser named Danilo. He used to do crazy wigs for Mugler, he’s one of the most respected people in the industry. He is so creative and we’ll do anything. He gives me, what a lot of people think are really ugly haircuts and I think they’re great. We always laugh because we’re like ugliest means the most and the most is the best, whether it’s good or bad. Lately we’ve been really into shaving, so we do different shapes and different cuts. And we always incorporate different geometrics. I go about once a month. For hair, there is a brand called Phylia de M. that really focuses on the scalp and the root of the hair. It uses a host of natural and organic ingredients to feed the hair. Your hair becomes so thick and healthy, it’s amazing. They even make a supplement you can take. The other products that I really like are Oribe, I think they smell amazing. I use a lot of their styling products, their shampoo and conditioner. The quality is incredible. I don’t have time for a lot of styling, I’ve trained myself to do everything quickly. I’m not good at doing complicated hair styles so I want it cut in a way that is cool but that I can do in five seconds. Day: I’m really into scent, so in terms of what’s in my handbag, I carry M/Mink by Byredo and a small vile of Tom Ford Santal Blush. I carry my lipstick, my Tatcha Rice Paper and that’s pretty much it. Night: I will stress one thing, I’m very adamant about products that have a lot of science behind them and really work in terms of anti-aging. At night I remove my makeup with olive oil. It really takes everything off. Then I wash that off with CeraVe Foaming Cleanser and then I use Retin-A Micro. I’m a big big believer in Retin-A. It’s a pain because you peel like crazy at the beginning but then afterwards your skin is incredible. It’s the one thing that has the most proof behind it to produce collagen and prevent aging. There is literally no other product in the world that will prevent aging better than Retin-A. You have to be really, really devoted to wearing sunscreen when you’re using this. On the nights when I don’t use the Retin-A, I use the CeraVe moisturizer. Thanks for all the tips! I’ll definitely try some of them! Love this! When I lived in New York I used to see her all the time. She has the most extraordinary skin in real life. This is inspiring. I like the idea of being happy as an important ingredient of our beauty ritual,i would add eating “good food “,i believe that all this beauty from inside are very much important to our skin. Agreed! What a perfect way to start the post. I love how clear and confident she is. No nonsense! I love Michelle Harper. It’s nice to see her here. She is incredible and unique. I love her approach to fashion and how “unpretty” her look is. Bravery and fun! Garance, it would be SO GREAT if you could do a link-list at the end of your beauty minutes. These woman are all so amazing I end up having a bazillion tabs open by the end of the post trying to find the things they mention! thank you garance (as always)! As a frequent traveler to Japan, would please Michelle let me know the brand of Japan’s sunscreen. This is the best beauty minute yet! L’article est super, et ce qu’elle dit a beaucoup de sens, je crois que je vais l’écouter pour le soleil, car c’est vrai que c’est agressif pour la peau, et sinon les pinceaux pour le maquillage sont super beaux. Elle a tellement raison de dire qu’il faut être heureuse. Une femme qui a le sourire aux lèvres, qui est pétillante avec les yeux qui chantent, c’est forcément plus beau que tous les maquillages du monde qui ne rendront jamais le sourire ! wow I enjoyed that – I love reading about skincare and makeup! I should really look into Fraxel treatments… love that she thinks cheap drugstore mascara is good to go…my favourite is Cover girl, its the only one that doesnt give me racoon eyes! Love her very singular beauty! I love this line “You can use as many products and as much makeup, but if you’re a miserable person, nothing is going to work”–it’s so true! Plus, love her use of drugstore brands as well. Great post! This is great. I love that she is unabashedly into her products, but balances that with the wisdom that happiness matters. I feel like the whole tone of this beauty moment is very different from the others, and I appreciate the variety. Thank you Michelle for these tips! You (and your hair!) are about as far from ugly as I could imagine! I always find the Beauty Minute recommendations that mix drug store picks with more luxury or specialty items to be so much more credible, not to mention achievable on my budget. Here is very specific, technical expertise mixed with common sense – so helpful! Good to see CeraVe on the list – I tried some of the line after reading one of Alex’s posts about winter skin and have loved them all so far. I will definitely try some of Michelle’s other recommendations. Thanks! J’ai parfois l’impression que toutes les nanas ont un rituel immuable de beauté. Y a que mois qui en change presque tous les mois? Probably the best beauty minute I read on your blog! Really interesting and knowledgeable person. I’d only ever seen pictures of Michelle Harper on the websites and assumed by her look that she was just another wealthy wack-a-doo. Boy-howdy, do I have to eat my words!! This is seriously the most intelligent, honest, and grounded approach to beauty I’ve ever heard from someone other than a suburban dermatologist with nothing to sell. I have a new-found respect for this woman and a pointy reminder to not judge a book by its cover. Truthfully, saying you cant look good if you are unhappy–a fairy tale. There’s plenty of miserable nasty goodlookin people out there. Other than that, I liked her picks. Gorgeous and unique. This is my favorite Beauty Minute. I learned so much, she is so smart, her skin is beautiful, and I love the part about that if you are not happy inside you are not beautiful outside. It is true it shows in your eyes. You can never hide it. Great Garance! Thank you! super, un vrai minute beauté bien détaillé et qui ne fait l’impasse sur rien. both to me. I will definitely try Michelle’s other recommendations. This is a fabulous and thorough beauty routine piece. With so many products out there, it gets very confusing. Thank you for making it so clear!!! I would love to follow your advise. I will probably start with buying some the products you mention. You look beautiful!!!! I really learned new beauty tricks from Michelle. Thanks for sharing them! Your skin looks bright and smooth. Ma routine de peau est tellement simplement. J’ai la peau grasse mais j’utilise comme hydratant l’huile d’argan light de Josie Maran pour hydrater le matin et le soir. Grace à cette l’huile, ma peau est BEAUCOUPPPPP moins grasse (presque pas je dirai même). Je me lave avec Cetaphile ou Philosophy purity. J’utilise le masque Julep Mint de Queen Helen une fois semaine, qu’on trouve à 3-4$ @USA (bizarrement il est introuvable ici à Montréal donc je demande à ma famille américaine). J’exfolie avec l’exfoliant St-Ives à l’abricot, une merveille selon moi, je le fais environ 2-3 fois semaine. Ma peau répond à merveille à cette routine. Je ne mets plus de fond de teint c’est fini sauf pour de grosse occassion, je suis à l’école donc à cette période les grandes occassion pour moi, c’est rare ahah! Je me demande si le fait que je n’ai pas arrêté de mettre du fond de teint à contribuer à l’amélioration de ma peau. Je me sens tellement mieux dans ma peau sans makeup. Je me fais que les sourcils, c’est primordial pour moi. Could we please know what that Japanese sunscreen is that she uses? I think the most important part is that she does once a year a laser treatment! happiness is not enough for having good skin! Gorgeous woman – such an inspiration. And there is no-one better out there to give beauty tips than Michelle who has spent years in the industry. Obsessed with the opening of this article. Bravo! Gorgeous woman! – such an inspiration! There is no-one better out there to provide with beauty tips than Michelle who has spent years in the industry. Also — obsessed with the opening of this article! Bravo! I think it is really scary to be so afraid of wrinkles…Sure, we do what we can but at the end of the day there is no cream nor treatment that is going to erase them. I think there is a fine balance between aging gracefully and naturally a la Parisian as opposed to looking too smooth and just plan weird. the best beauty minute ever!!!! excellent choice of person with supported strong views on beauty!!! By far the best and most honest beauty minute today….obviously i love all the other features. She is true to herself and her beat!! Quelle femme surprenante! Qui aurait pu croire qu’elle ne met que 5 minutes pour s’habiller. En passant, la crème solaire auquelle elle réfère est probablement Anessa de Shiseido qui est extrêmement populaire ici au Japon. Thanks for the wonderful tips! You look great and beautifullllllll! Wow, I feel so much better having an expert like Michelle say that it’s OK to love Maybelline for long dark lashes. I know for foundation it is so much more complicated by skin type and allergies and climate etc, but I always felt like I was cheating my eyelashes. I am going to print this out and keep close by like Makeupedia. I vote for a column called “Michelle’s Makeupedia” – who else is on board? Yes, I vote for a column called “Michelle’s Makeupedia” too! This is wonderful, do you have any suggestions for air travel? My face seems to get so uncomfortable – is it the stale air or dryness? I had a terrible allergic reaction to the sap of a braided Ficus tree, hives and I am afraid of scarring. What is your favorite anti-scarring solution for sensitive skin ? And scar make-up cover? Love beuty tips from #MichelleHarper. They are straight forward and easy to follow. Delightful. She is beautiful and refreshing. Thank you Michelle for sharing your thoughts and beauty tips! Love #MichelleHarper and all her #beauty tips . Agree with her totally that hapiness is the best recipe for life!